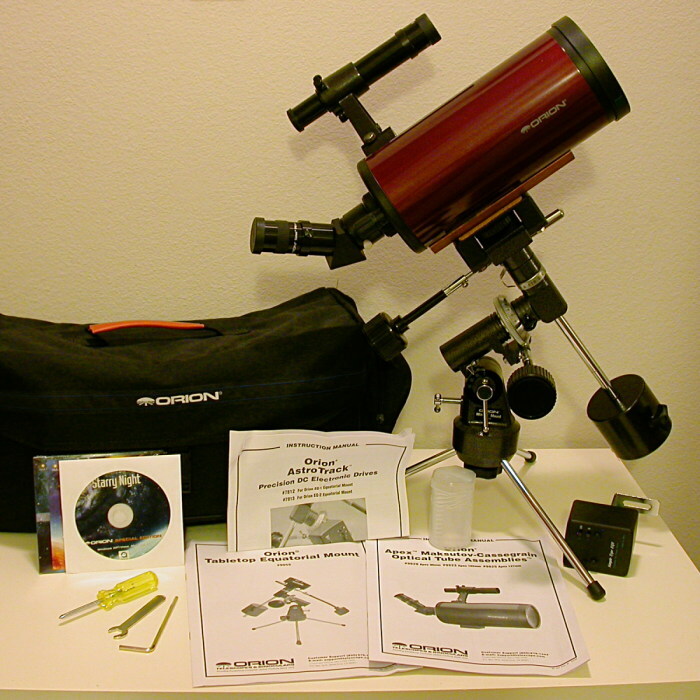 When I caught the astronomy bug in the fall of 2007, my first priority was to get a decent scope. I spent about a month doing research in print and online and just about everyone said the same thing: get a cheap 6″-8″ Dob and some serviceable binoculars and start learning the sky. This I did. My first scope was an Orion XT6 that I named “Shaft”. For two and a half years, Shaft was my workhorse scope. But Shaft was still getting broken in when I decided that I needed something more portable. An XT6 is about 4 feet tall and weighs 33 lbs. 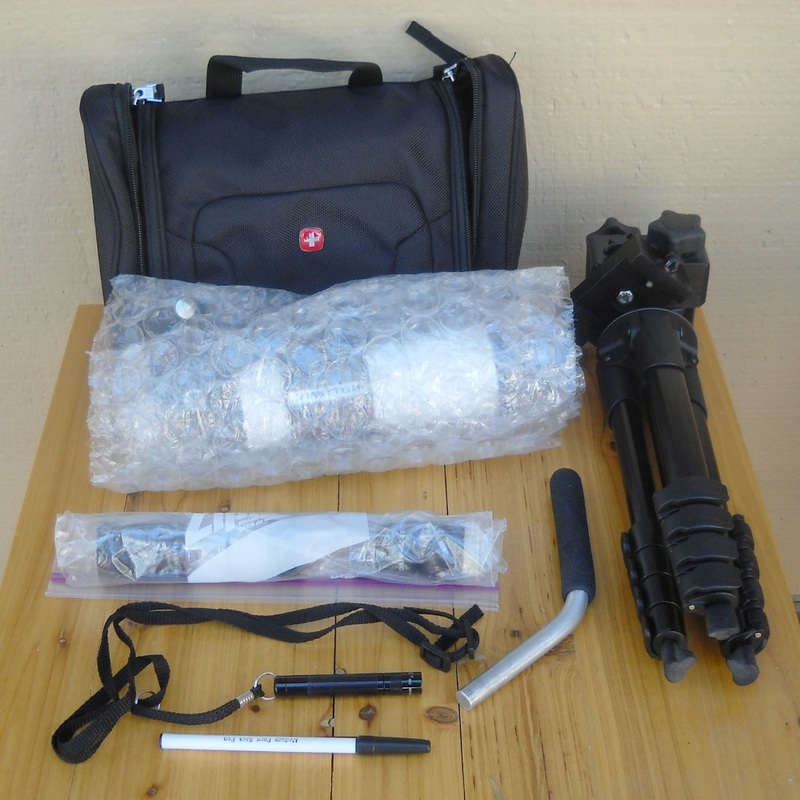 It’s easy enough to take the tube off the base and stow them both in the car for camping or a trip to the mountains, but I wanted a scope small enough to fly with. My parents live in rural Oklahoma under very dark skies and I knew all too well what I was missing here in the light-polluted swamp of California. So began my quest for a grab-n-go scope. 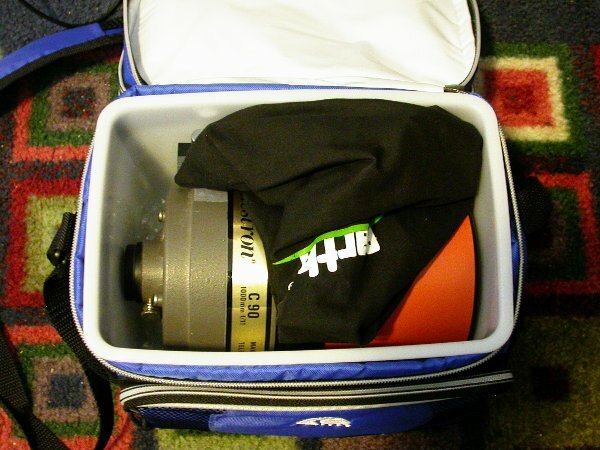 Not just any grab-n-go scope–some people consider a 6″ Dob to be grab-n-go. What I was really looking for was my “no excuses telescope”: a scope that would be so triflingly small and light, and yet so capable and easy to use, that I would never have an excuse not to have it along, whether I was driving up the mountain for a quick peek or flying to another hemisphere. I’ve always had a thing for Maksutov-Cassegrains so my first venture was a little Mak, an Orion Starmax 102, that I picked up used. And it was a great scope. But I realized that a StarMax 90 would deliver most of the performance of the 102 but it would be a couple of inches shorter and a couple of pounds lighter (3.5 vs 5.5, if I remember correctly). So I got a Starmax 90, found it delightful, and sold the 102 (that’s my ad photo above). The Starmax 90 was my small scope for a long time; it’s the scope I waxed lyrical about in this post. But I also thought that the old orange-tube Celestron Cassegrains looked pretty sweet, and I was entranced by the tank-like build and simple operation of the C90. Same aperture as the Starmax 90, but it was another couple of inches shorter. So I found a used one on Cloudy Nights and sold the Starmax 90. The C90 has been a very fun little scope. It is even more rugged and versatile than I expected, and it fits in an insulated plastic-lined six-pack cooler, to boot. 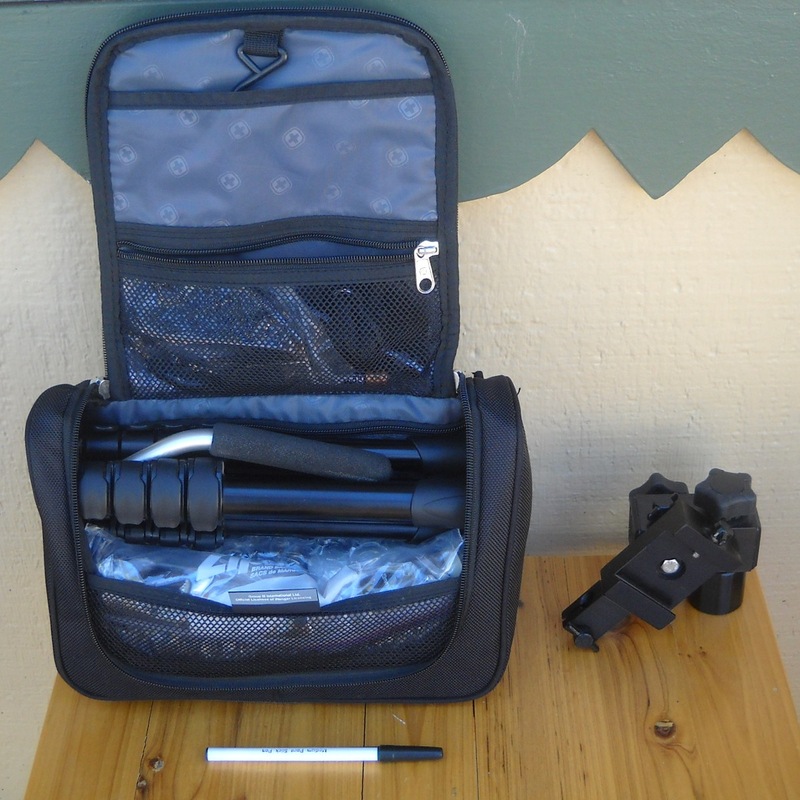 Nothing like getting an armored scope case for $5.99 at Wal-Mart (the black thing laying over the tube in the photo above is the finder, wrapped in one of the soft cloth bags that come over my wife’s favorite shoes). But on some level I’ve known for a long time that the C90 would be at best a temporary stop on my quest for the smallest reasonably capable telescope. Because a couple of years ago when I was surfing Cloudy Nights I discovered the Stellarvue SV50. As I understand it, the SV50 started life as a high-end finder for larger telescopes, and one version is still sold that way today. I fully support that; one of my first upgrades for Shaft was a 9×50 finder that made star-hopping a lot easier. But people started using the SV50 as a telescope in its own right and it developed quite a following. 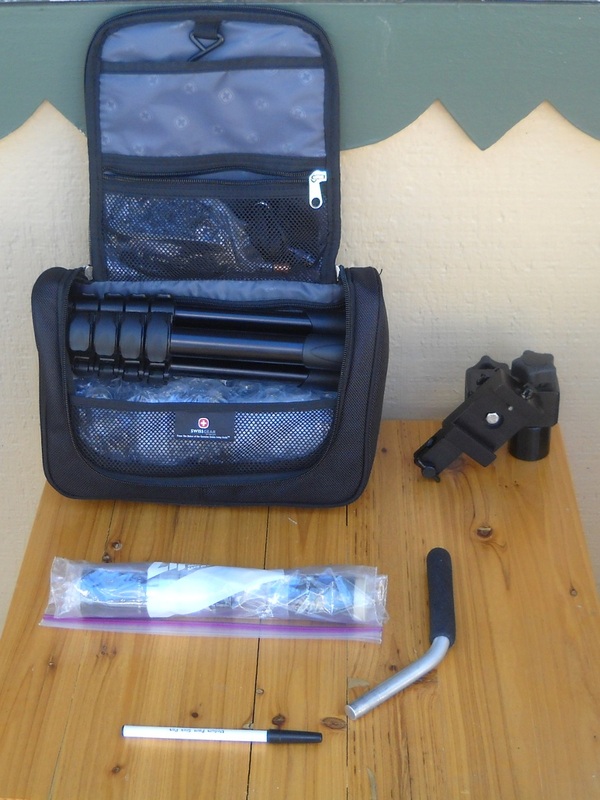 It is now sold as “The Little Rascal”, a stand-alone spotting scope with a clamshell mounting ring, eyepiece, and in the latest guise, a carrying case. My SV50 was a present to myself for finishing my summer teaching. I bought it from Oceanside Photo & Telescope on the last possible day that I could have done so and still have had the telescope delivered before I left for Uruguay. I was on the phone for maybe 5 minutes tops and in that time the sales guy (whose name I’ve unfortunately forgotten) answered all of my questions instantly and authoritatively, processed my order with admirable efficiency, and even managed to find me a discount I hadn’t known about. If that’s not good customer service, I don’t know what is. This is a tiny, tiny scope. The aperture is 50mm, the focal length is 205mm, the magnification with the included 23mm eyepiece is 9x. So you could think of it as one half of a pair of 9×50 binoculars. Except that it’s not. For one thing, it accepts any eyepiece in the standard 1.25″ barrel size, so you can vary the magnification. And it is really, really well made, as one would expect from StellarVue. There are binoculars out there that are made to equal or better specifications, and there are binos that have interchangeable eyepieces, but they’re out of my price range so they don’t come in to this story. And you can put it on a tripod and look at things directly overhead without breaking your neck. Also, having had the opportunity to compare the performance of the SV50 with that of my admittedly low-end 50mm binoculars, the image in the SV50 seems brighter. Possibly because it has fewer internal reflections to steal light from the path, possibly because it’s just a better made instrument, possibly because my binoculars are cheap. Whatever. I’m deliriously happy with the SV50. The SV50 is 9.5″ long and weighs 1.5 lbs. By comparison, the C90 weighs 3.9 lbs fully loaded (i.e., with diagonal, eyepiece, and finder), and the Starmax 90 weighed 4.6 (the less said about the positively Brobdingnagian Starmax 102, the better). Crucially, this means the scope is light enough to ride comfortably on my little Manfrotto 785 tripod , which only weighs a couple of pounds itself. 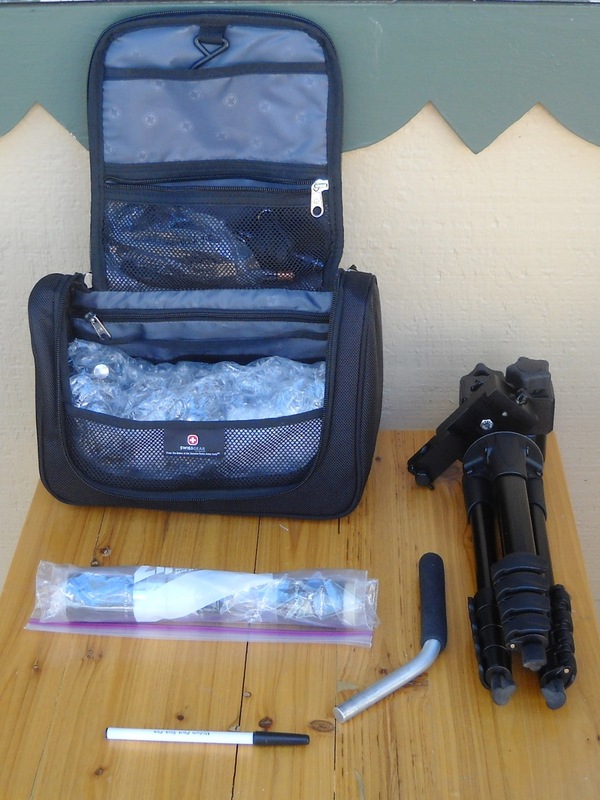 And that’s good because the folded tripod is the same length as the scope, so it fits into a roughly equal space. I found a little travel shaving kit at Target that holds the scope, doubly wrapped in bubble wrap; the tripod; three eyepieces; the handle for the alt-az head that goes atop the tripod; my mini red flashlight (a mini Maglite painted over with red nail polish); and a small notebook and pen for recording observations. The only thing that doesn’t fit in the bag is the alt-az head itself, a DwarfStar from Universal Astronomics. Close enough, says me. By comparison, the ~4 lb C90 and StarMax 90 require the beefier Manfrotto 190CXPRO4 , which weighs 3 pounds and folds down to 21″. Which, okay, means you can still get away with scope, accessories, DwarfStar, and tripod for just under 9 lbs. But why settle for 9 when you can have 4.5? More importantly, I have not had the courage to put the bigger (and much more expensive) tripod in my carry-on luggage. For the love of Pete, I use a netbook as my primary computer because I hate carrying heavy stuff through airports. 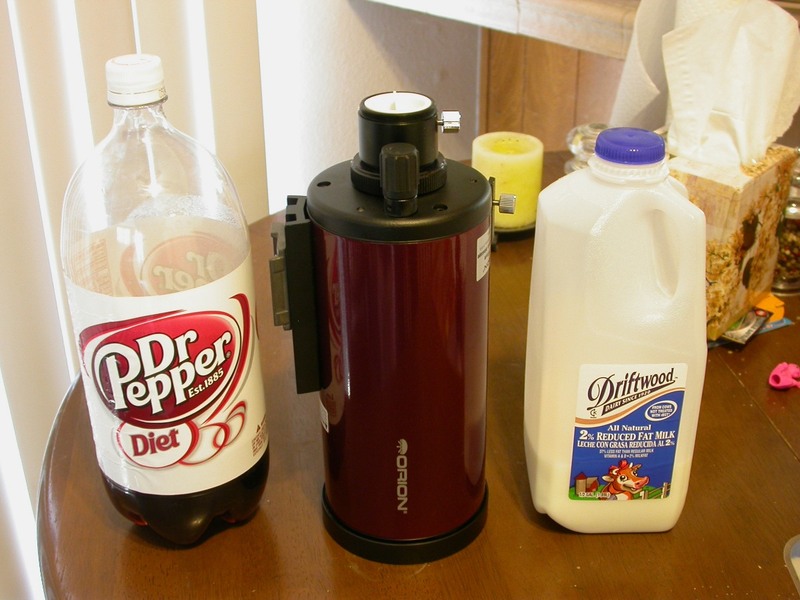 Anything that gives me adequate functionality at half the volume and mass, I will be on in a heartbeat. For eyepieces I’ve been using the included 23mm eyepiece, yielding 9x; a 10mm Orion Plossl giving 20.5x; and a 6mm Orion Expanse giving 34x. At 9x the SV50 functions as its own finder and requires no other. At 20.5x the scope just gets out of the way and lets me observe. It is honestly one of the most hassle-free setups I’ve ever used. At 34x the optical train is starting to pant a bit. A focal ratio of f/4.1 is hard on eyepieces, especially widefields. The view is still acceptable but focus gets to be very touchy. Fortunately the built-in helical focuser is super-smooth, with no backlash, and is a real joy to use. At the end of the day the three eyepieces get rolled up in a Ziploc bag to fit into the small empty space between the scope and tripod. So far my SV50 has only seen serious use away from home. In Uruguay I used it to do all of the observations for the Southern Sky Telescopic Club, and this weekend in Big Bear Lake I spent a pleasant hour chasing some Messiers. 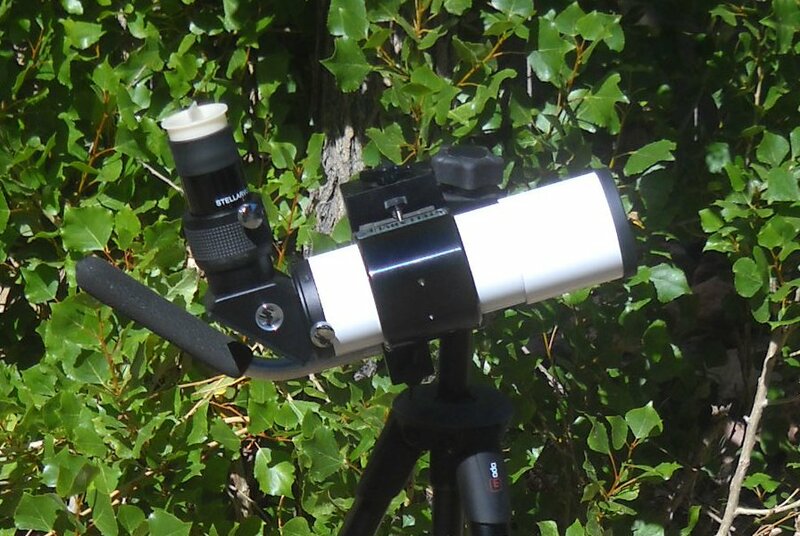 In fact, I’ve decided to re-observe all of the Messier objects with this scope. I don’t know how long it will take because it will absolutely require dark skies, which I don’t get to as often as I’d like, but I’ll just chip away at it as opportunities present themselves. In any case, I think my quest for the “no excuses telescope” has finally come to a happy end. I don’t know what I’ll obsess about next, but if you stick around you’ll probably find out. Clear skies! You are currently browsing the 10 Minute Astronomy blog archives for the day Tuesday, August 10th, 2010.